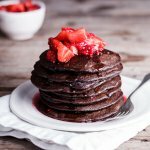 These easy and healthy chocolate banana oat pancakes are flavoured with raw cocoa powder and topped with macerated berries for a guilt-free breakfast. I know I am not alone in saying that finding quick and easy but healthy breakfasts my kids will actually eat is bloody hard. I don’t know about you guys but it’s becoming increasingly easier to just give them what they want (a bowl of sugary cereal..yuck) than to fight with them about why it’s important to eat a good, balanced, nutritious breakfast before school. There are a few ideas up my sleeve (they are currently loving granola and yoghurt and I am planning on making LOADS of smoothie popsicles for when Summer really gets going) but there’s only so many bowls of my granola they’ll eat before they start complaining. A while ago I developed an easy and healthy pancake recipe made with bananas and oats which they absolutely loved and a few weeks ago when Aidan asked for pancakes for breakfast, I thought I’d give my tried and trusted recipe a twist by adding a few more flavourings. 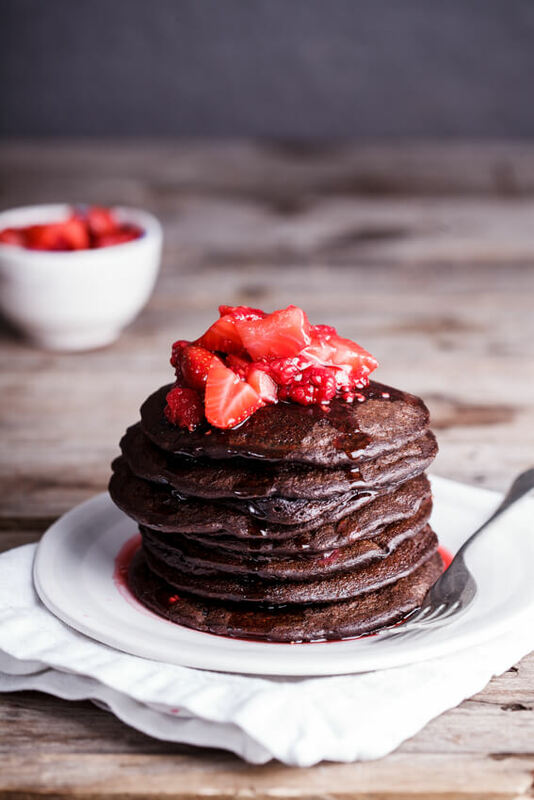 Raw cocoa powder gave them a serious chocolate hit and along with some vanilla extract made these chocolate banana oat pancakes taste like a very sinful dessert. Especially when topped with macerated berries. 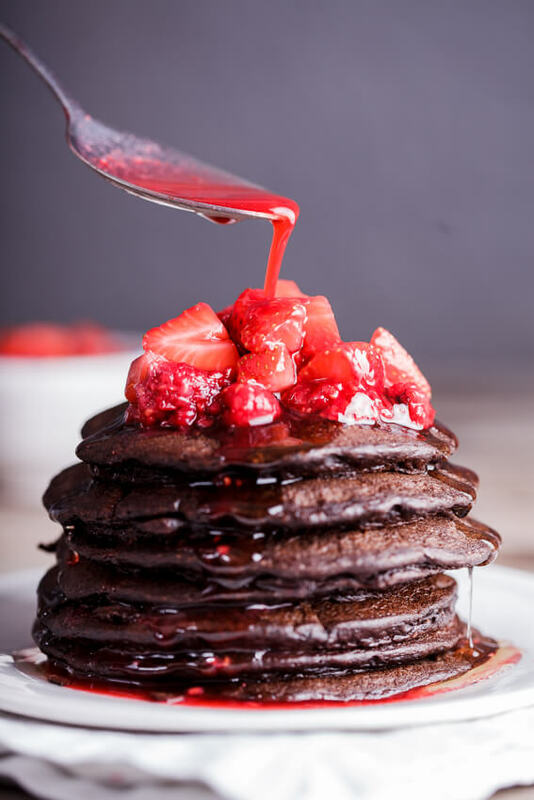 I think what is so completely awesome about this easy and healthy pancake recipe is that it’s all made in a blender (I’ve even used an emersion blender and a tall jug to make the batter) and everything is just blended in one go making it perfect for busy weekdays. Getting back to that original recipe though, I actually can’t believe that to this day that it is the most viewed recipe on my blog. Ever. It’s so funny how that happens, isn’t it? 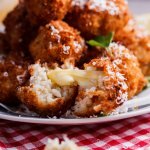 A recipe that I developed on the fly, didn’t take much time with the photos (obviously) and then posted haphazardly one day became crazy popular. Go figure. But what I love most about that post is all the comments. So many people have commented telling me what they love about the recipe and how they often make it for their families. Something that I learnt from my readers is that this batter actually performs way better if you leave it to rest. The batter thickens a little and the pancakes just fry so much better. Keep in mind though that they are much more delicate than a regular pancake because there’s no flour to add stability but that also results in a seriously tender, moist pancake. Serve them simply with maple syrup or with macerated berries for an indulgent yet completely guilt-free breakfast your family will drool over. In a blender, combine the peeled banana, eggs, oats, baking powder, cocoa powder, vanilla and salt. To make the macerated berries, combine the berries (slice the strawberries if using) with the honey and water and allow to stand for 10-15 minutes until the berries have started releasing their juices. Serve the pancakes with the macerated berries or simply with a drizzle of maple syrup. Can I mix in my NutriBullet? Thank you for this recipe, it was delicious! My 3 year old and 2 year old loved them too! It was quite chilly this morning so instead of making the macerated berries, I simmered frozen mixed berries over the stove with a bit of honey and then added chia seeds to make a warm healthy jam. I can’t wait to make them again! Ooh I LOVE the idea of having them with chia jam! I’m sure egg whites will be fine. They definitely need the egg to give some structure to the pancakes though. how many pancakes does one batch make? sounds like its going to be about 4 pancakes? calculating nutrition facts for this recipe before i make it. It really depends on size. I usually get 6 small-medium pancakes out of each batch. Does it have to be blended as I don’t have one? Yes, unfortunately this is a recipe that requires a blender. I really liked these! Just had them for family breakfast this morning! They turned out perfectly! If I wanted them sweeter I could add honey or chocolate chips to the batter, but its not necessary when eating the pancakes topped with maple syrup. I’m so glad to hear that Lisa! I can’t wait to try this! After losing a lot of weight I am very cautious of calories and I have noticed your recipes do not have the calories on them. Is there a way to see how many calories these pancakes have? I hope you love them Raquel. I know there are nutrition calculators available on Google. Which do you use, UK or US cup in measurement? My cup measures 250ml. I have a conversion chart on the sidebar to clarify. Can I use steel cut oats instead of rolled oats? I’ve never tried it with steel cut oats and am not sure if it will give the same structure to the pancakes? This recipe interested me due to its few ingredients and medium energy required to make. So I made it this morning, it was good. Note I did not make the berries, for extra sweetness i had sliced banana with the pancakes but strawberries would definitely go well with this. I felt the need to add a tablespoon of flour because the mixture was quite liquidy. They also proved to be a bit difficult to flip without breaking in half. all in all a good recipe. Can this be used as a waffle mix? Yep, it should work perfectly! can the oats be skipped? Unfortunately not. Because these pancakes are flourless, they need the oats to give them structure. Can the banana be skipped? Unfortunately not. Because there are so few ingredients, the banana adds a lot of “structure” to the pancakes. I got the ingredients to make these especially! But I have a question about banana size because when I went to the get some, the grocer only had the biggest bananas I’ve ever seen! Do you know the weight or how many cups of banana would be good for this recipe? Planning to have this with toasted hazelnuts and cream because I am that weirdo who doesn’t like berries and chocolate together! Can’t wait! You should have around a cup to a cup and a half of bananas. 🙂 Yum! The hazelnuts sound awesome! 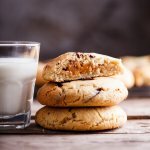 How would I double or triple this recipe? Got a big family that I’m trying to get eating healthy. Also, can I make these ahead and freeze them like I do my regular buttermilk pancakes? Thanks for sharing! You could just double/triple the ingredients Michelle. I don’t see why you couldn’t freeze these but as I haven’t done it before I’m not entirely sure how they will behave. If you do try it, please let me know how it went. Where can I find nutrition information for these pancakes? Has anyone calculated some basic nutrition info? I’m looking for calories, macros, and sugar content 🙂 Anybody know? I have actually found the macros end up being about the same as regular pancakes, however I do feel like the oats fill me up for longer. Thanks for sharing your recipe! When do I add the raw cocoa powder and vanilla? Do I assume it’s with the banana, oats, eggs, and salt? Also for the oats, are they quick cooking or old fashioned. I went to make these this morning but there was not enough info so I didn’t want to make assumptions. Thanks. Yes, everything goes into the blender together. Old fashioned rolled oats are best. a resounding yes to chocolate for breakfast!!! my boys would swoon over these. and so much better than a boring bowl of cereal! Right? And I feel so guilty every time after giving my kids sugary cereal for breakfast so this has become a standard in our house. 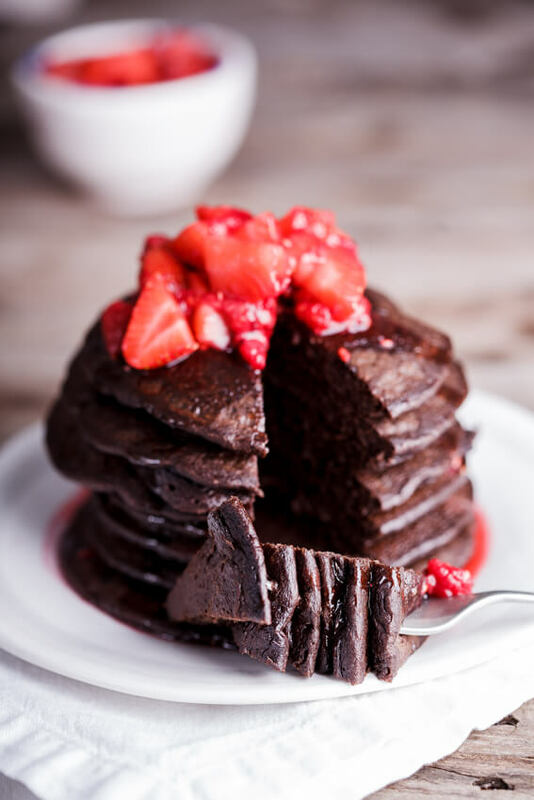 Anything with healthy and chocolate in the title is good in my book! My kids will love these babies. I have no doubt the kids just love these Alida! What’s not to love? 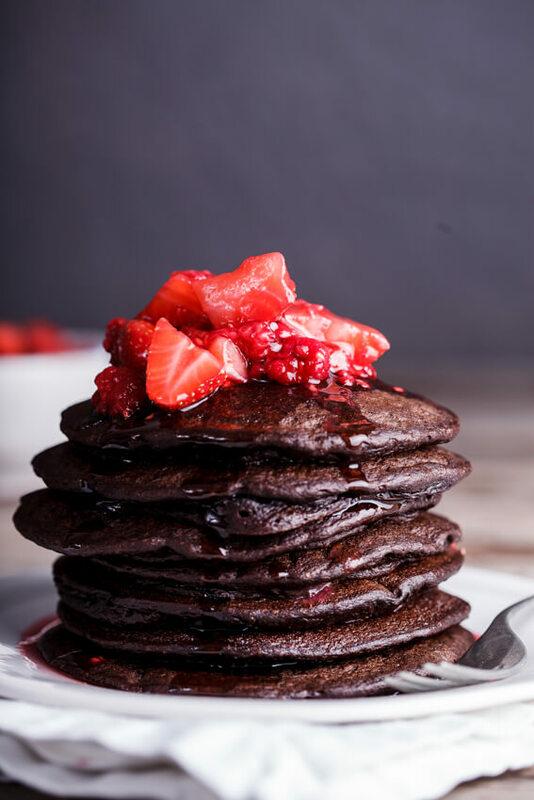 A healthy, delicious, chocolately breakfast is the way to go! Making these for my son Casey when he comes home from college! Oooh, please let me know what he thinks when you’ve made them.